GOOD news book lovers! Bookperk just made things easier for you. Bookperk, a subdomain that pairs new and bestselling books with exclusive merchandise and interactive author experiences. 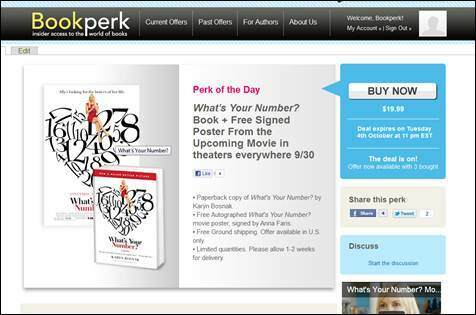 The deals site is very cutting-edge, especially for a publisher, and I thought you might be interested in this exclusive book deal as it pertains directly to What’s Your Number, the book plus a signed movie poster for Hollywood fans alike! The book was originally released as 20 Times A Lady and went through a renovation in accordance with the exciting movie starring Anna Faris, Joel McKale and Chris Evans which will be released on September 30 nationwide. This Bookperk offer features a copy of the book in paperback, as well as a poster signed by the entire ensemble cast. 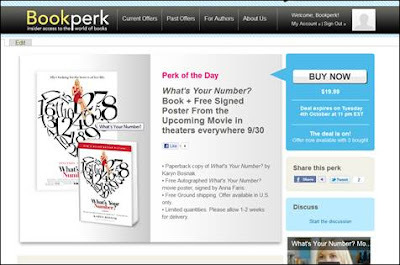 This offer is valid through October 4th: http://www.bookperk.com/offer/whats-your-number-movie-01. Bookperk is a site that is constantly ebbing and flowing with the way in which entertainment and literature meet.